← who’s in control of this haircut, anyway? Probably the most well-know superhero stories are the so-called “origin stories” that tell how an average, every-day citizen was bestowed with extraordinary abilities and became a hero. My very own “comic book origin story” does not begin with a tumble into a vat of chemicals, a radioactive bug bite, or the violent murder of my family-slash-true-love. In my case the catalyst was a pile of battered old comic books, collected from various used book stores in Coimbatore, stashed away behind some bed mats on a high shelf in a South Indian village. The transformation that ensued did not lead to heroic exploits, either. This is not at all surprising, of course, because if I have a super power, it is nothing more than the ability to continually produce evidence of my own latent geekiness, in ever new and unexpected ways. The stack of comics had been collected by me and some other students from my university, while we were being hosted by a family in rural Tamil Nadu as part of an education abroad program. You see, in addition to studying cultural topics of personal and academic interest, we were also planning a birthday party. It so happened that while we were in India, one of the young men among us would be celebrating the completion of one more year of life, would be celebrating, it so happened, on the very same day that the movie Batman Begins was being released in India. Seeing his excitement about being able to watch this much-anticipated film on his special day gave someone the idea that we should plan a Batman-themed birthday party for him. So began the collecting of used Batman comics, along with whatever other Batman-related paraphernalia we could find (the one item I remember now was a Batman: Begins wall calendar from Pizza Hut). Since this all began about a month before the actual party, there were plenty of opportunities for the rest of us to sneak a peek at the comics whenever the birthday boy wasn’t around, slipping an issue or two from behind the bed mats while cooking dinner or taking a break from our studies in the afternoon heat. It wasn’t long before we started recognizing how some of the magazines fit together in larger narrative arcs, and our comics shopping became even more focused as we began looking for the issues that would fill in particular gaps in the story. It was Jim Lee‘s iconic art in Batman: Hush that hooked me, paired with Jeph Loeb‘s accessible, yet wildly sensational story. That, and the fact that upon my return home, I was able to purchase all twelve issues of Hush in trade paperback from my local bookstore. Up until then it had never occurred to me that comic books might be consumed in any format other than the once-a-month direct edition magazines (I think the comic book industry as a whole was also coming to a similar realization about that time). Suddenly freed from the necessity of becoming a comics collector in order to be a comics reader, I began prowling amazon.com for more stories. And so it was that, while thousands of “lonely blue souls” make the pilgrimage to India each year in search of a kind of spiritual awakening or a pure moment of self-realization, I returned having found comic books. Suggested Comic Book Origin Stories: Doctor Strange: Beginnings and Endings; Superman: Birthright; Spider-man: With Great Power …. 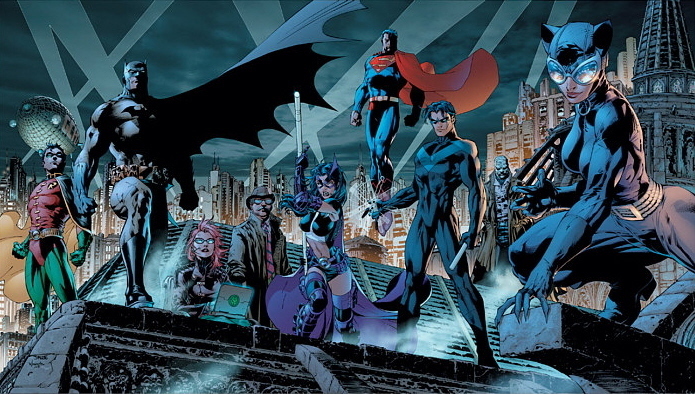 This entry was posted in nine things about comic books and tagged batman, batman begins, batman: hush, comic books, geekiness, india field study, jeph loeb, jim lee, origin story. Bookmark the permalink. The Knights of the Lunch Table books I hear are pretty good. I’ve also heard of the Lunch Lady graphic novels. Both of these are obviously set in school … and both I think are recommended for a little older than age 7, but your kid would be all over it. As far as actual superheroes, I know Marvel has its Marvel Adventures line for kids, with Spider-man, Iron Man, Hulk, Thor, etc. titles. They also have Mini Marvels. DC Comics has a kids line as well, but it’s a little bit more difficult for me to trace the monthly comic releases to the trade paperback collections you could track down on amazon.com or elsewhere. They do have their Tiny Titans books, I guess, and probably a lot of others. Bottom line is that Marvel and DC Comics are very interested in selling you superhero stuff for your kids.